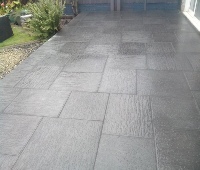 "Thank you for the work you have done on the patio and pathway in our back garden. We are very pleased with the quality of your work and with the end result and would be happy to recommend you and use The City Gardener again in the future." "Couldn't be more please with the work completed. Professional Landscape Gardening!" "Thank you very much for your hard work, it paid off as I now have the garden of my dreams." "Thank you to the whole team for the hard work and patience in re-landscaping our garden - it was no small task. The professionalism and friendliness from the team was amazing! During the project, my husband and I changed our views of our design, and the team were more than happy to oblige to each and every request we put their way .... nothing was too much trouble. We simply have a 'stunning' garden, better than we ever thought it would be and of which we are extremely proud of .... thank you so much! I would thoroughly recommend The City Gardener!" 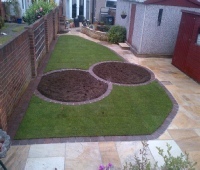 Mr and Mrs Cook engaged the city gardener to create a fresh, new look for their back garden, which was tired, and uninspiring The eye is led to the to the 2 brick edged circle planting beds in the middle of the lawn along with the new pathway the length of the garden. Client requested a low maintenance child friendly garden. We excavated and removed 32 ton of soil to level garden. Supplied and erected new fencing to perimeter of garden. Supplied and constructed new base for outbuilding. 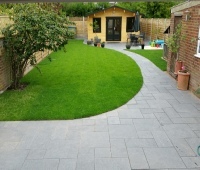 Created shaped patios and curved path using granite paving and finished with new turf to lawn areas. This small garden had a decking area to the rear in urgent need of repair or replacing- After consulting with the client, they decided to replace with a patio. This particular garden needed a fairly simple, straightforward design. This is a good example of how a fairly simple design can transform a dull space into an interesting garden with room for grass, generous planting and areas for seating. Mr and Mrs Patterson wanted a low-maintenance outdoor-living area which was on a split level. 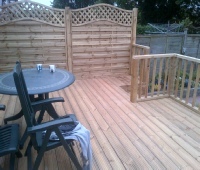 So we built a new softwood sun-deck for easy relaxing and overlooking the garden - ideal for BBQ’s or loungers. 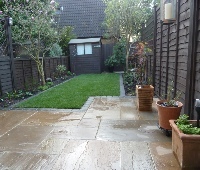 A small tired garden that the client wanted to makeover making it easy to maintain - so we laid a patio by the back door making a nice seating area overlooking the newly laid grass and planted garden with new fence too. A simple, effective solution gives this small garden more space and interest. It feels larger and is more practical and easier to maintain. Clients wanted damaged and dangerous step work removed and replaced. We removed the old brick work and paving slabs. 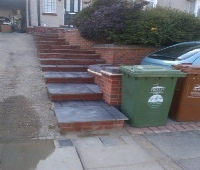 Supplied and constructed new step work and paving areas finished with black slate paving, with integrated drainage..
“The City Gardener listened to what we wanted to achieve. The finished job looks great and we can't wait to see it in full bloom!."